Opened in 2009, Bermuda's World Heritage Center is located at St. George next to the Penno's Wharf Cruise Ship terminal. The building used to be the Queen's warehouse that was originally built in 1860s for stocking ships cargo. A multi-million dollar project was taken up by St. George's Foundation to create this center in 2005. The original pulley used to pull cargo to the upper floor can still be seen inside. 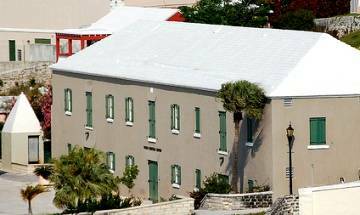 The center provides a comprehensive overview of St. George's Town along with its historical background, and how it became a UNESCO World Heritage Site in 2000. It is a multi functional building which has Orientation Exhibits Gallery, an Interactive Education Center, Retail Galleries and Theatre. The center uses pictures, miniature models and dioramas, interactive videos, interpretive panels and short films to depict the entire story. The visitors first walk in to the Trip Planning Area where large photos of historical buildings, museums, monuments and forts are displayed to give a glimpse of the town, its British fortifications and history. There are staffs who answer your questions and provide guidance. You can collect maps and self guided tour guides from here. Next to it is the Orientation Exhibit Gallery. 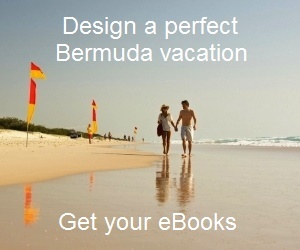 This is where you will get an end to end idea of Bermuda's history. It starts from the time when it was first discovered by Sir George Somers and his men when they accidentally landed up ashore in 1609 as their ship Sea Venture got wrecked at a nearby reef. The orientation covers all the way up to the American Civil War where Bermuda too played a key role. There are interactive videos, miniaturized version of St. George and diorama, pictures and panels that nicely unfold the story. A short 12-minute film "A stroll through St. George's" is shown daily. The historical coverage also includes British colonization in Bermuda, the island's maritime heritage including whaling, shipbuilding and sailing, its connections with Virginia's Jamestown, the episode of Bermudians helping to steal gunpowder on request from George Washington, Bermuda's role in US Civil War and more. There are attractions for kids and children as well. Here you will see a full size mock-up deck of the ship Sea Venture. There is a costume corner where kids can dress up like figures of early times. In the upper floor, there are more detailed information about the island and the eastern part of Bermuda. On one side, there are videos where actors perform the roles of early historic figures. On the other side of the room, there are large touch screens showing the town's architectural background and other details. It also shows links to the Native Americans who were brought in as slaves and took residence mostly at the St. Davids Island located in the same parish. There is an admission fee of $5 per adult, $2 per child (age 5 to 12). Children under 5 are free. Mondays and Thursdays: Special tour at 10:30am. 19 Penno's Wharf, St. George, Bermuda. Phone: 441/297-5791. The World Heritage Center of Bermuda is located at the western end of Water Street and next to the Penno's Wharf Cruise Terminal. It's only a few minutes walk from Kings Square which is the main town center of St. George. Check out St George's Map to see the location of Penno's wharf where the center is located.